Although the term CEREC crown may still be somewhat unfamiliar to those outside of the dentistry field, today more and more people are becoming quite familiar with the term as the CEREC crown is quickly proving itself as a revolutionary new tool that has provided a convenient and effective solution for both dentists and patients alike. One such issue was that of time, as it would often take a matter of weeks for a finished crown to return from the dental lab. This typically required at least two separate appointments for the patient to receive the complete treatment. Another source of problems for patients was the often cumbersome temporary crown. The temporary crown was fitted to provide the patient with aesthetic relief. Although the crown was successful in providing a temporary solution, it was also prone to breaking or falling out. However, thanks to the numerous advancements within the realm of dental technology, the process of receiving a CEREC crown requires only one appointment in which a patient will receive a permanent high-quality crown in a matter of a few hours. The CEREC crown, which stands for Chairside Economical Restoration of Esthetic Ceramics, is achieved through the use of digital imaging. This allows the dentist to determine the exact specs of a crown, as opposed to simply relying on dental impressions. This cutting-edge process not only creates a crown that is effective and durable but due to the porcelain material used in the creation of the crown, the CEREC crown looks almost completely natural and can even be customized to match the exact shade of the patient’s teeth. Generally, the CEREC is around the same price range as the conventional crown, and most insurance providers offer a similar degree of coverage for a CEREC crown as they would to the conventional crown. However, keep in mind that coverage may vary due to the patient’s insurance provider as well as possible additional procedural expenses. 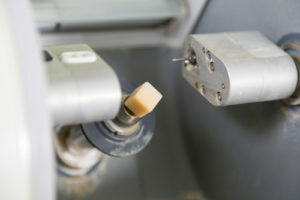 While the CEREC crown remains a relatively unknown concept to some outside the realm of professional dentistry, this breakthrough in dental technology is quickly becoming a sought-after service by patients nationwide. Related Read: Your Dental Benefits May Expire Soon – Use ‘Em or Lose ‘Em. If you’d like to learn more about CEREC crowns, give Overland Park Dentistry a call at our south office (913) 647-8700 or our north office (913) 341-2380 and one of our friendly staff will answer your questions.